We had some friends over for dinner, and they specifically asked for something sous vide. Since we already had the entrée planned, we decided to do a sous vide appetizer or salad. Perusing through Modernist Cuisine at Home I came across Sous Vide Tuna Confit. I figured this would work really well to put on a green salad with a sharp vinaigrette. Let’s start with the end: it is amazing; I recommend this dish with no reservations. It has an amazing tuna flavor, without being too fishy. It has a smooth texture complimented by the fat of the fish. And, I don’t know of another way to make tuna like this. It really highlights the power of sous vide cooking. An added bonus is that this recipe doesn’t use plastic bags as the cooking vessel. I am always a little scared of all that plastic leaching into my food, regardless of the research to the contrary (my belly helps my brain get over it though). Also, I don’t like having a big chunk of plastic having to go to the landfill either. I’m excited to try the confit-in-a-mason-jar method more often now. I’m planning on making a sandwich with some of the leftovers too. I might be even more excited for that. In a medium bowl, combine water, salt and sugar. Stir until all the salt and sugar have dissolved. Cut the tuna into 1 inch cubes. Place the tuna into the brine (make sure the tuna is fully covered by brine), cover the bowl and refrigerate for approximately 24 hours. Heat your water bath to 124ºF. After the tuna is done brining, rinse the cubes in a colander under cold water, then pat dry with paper towels. Divide the tuna evenly among 3 16oz canning jars. Cover the tuna with the oils. Place the lids on the jars and seal well. Place the tuna in your water bath and cook for ~1 hour. In a salad dressing container (or, a canning jar) combine 6 tablespoons olive oil, vinegar, salt and black pepper. Whisk (or shake furiously) until well combined. Mix the dressing with the tomatoes and greens. 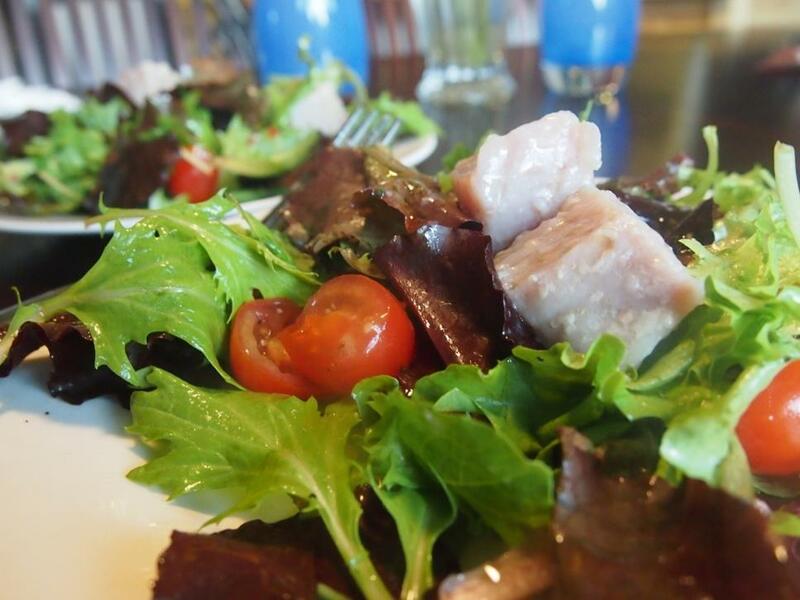 Place a serving of dressed greens on a salad, and then place 3 to 4 pieces of tuna atop each serving.